Visitors have been flocking to a canal in northern Germany in order to get some serious playtime in with a very friendly dolphin. The mammal has been delighting bathers in the region since it appeared in the Kieler Foerde inlet several days ago. According to the German Waterways and Shipping Office, it has often been spotted swimming in and out of the canal that connects the Baltic Sea to the North Sea. 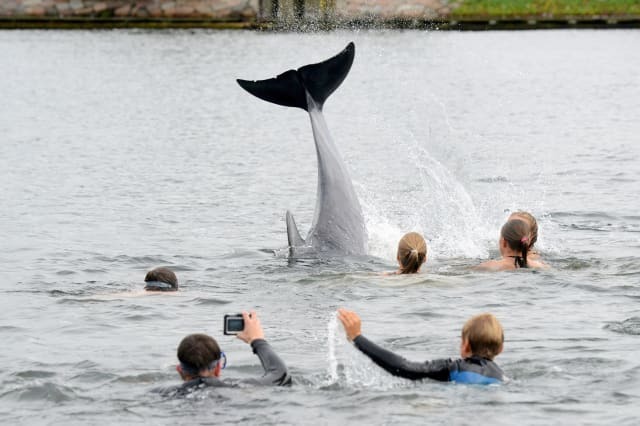 Hundreds of children have swum with the dolphin since Friday, some even taking rides on its back, reports the Guardian. Visitors say the dolphin is happy to be embraced and to pull people along. But authorities are warning people not to get too close to the animal, warning that it may feel harassed. They are also concerned that swimmers are getting in the way of ships using the canal - although the dolphin itself appears to be unfazed by the traffic flow. The Institute for Baltic Sea Research said it suspected the dolphin had been swept in during the winter of 2014, when violent storms forced about 200tn litres of North Sea water into the Baltic Sea, the biggest saltwater inflow for 60 years. Bottlenose Dolphins (Tursiops truncatus) swimming along ocean floor, Red Sea. Atlantic bottlenose dolphin, Grand Bahama. Wild spinner dolphins off the Big Island of Hawaii. Caribbean Sea, Roatan, Bay Islands, Honduras.